This small venue is big on Asian flavors, offering Mandarin, Cantonese, Sichuan, Japanese, Korean and Thai favorites. 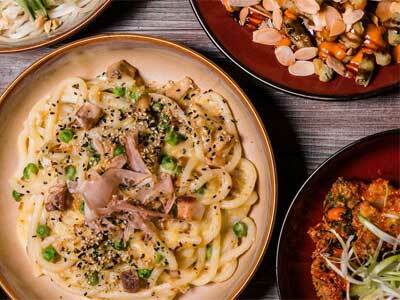 They also use Asian ingredients to make Italian and American favorites with a creative twist. This is a small, casual, fun venue with delicious and unpretentious food. You must try the noodles, either the ramen mac with cheddar, cream cheese and smoke gouda or the vermicelli noodle bowl. A favorite entrée is the braised oxtail with lotus root, mushrooms and gravy. Order the bang-bang broccoli as a side dish or even an appetizer, it’s that good! Don’t forget to try the Nutella honey toast for dessert.